Don't forget about this guy. The red-head second string quarterback for the University of Georgia. 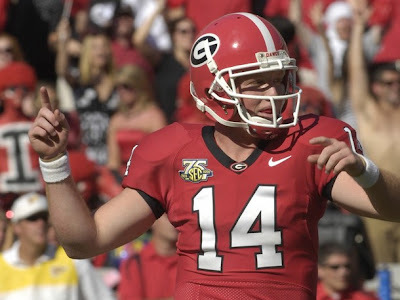 #14 just might have to come up big for the Dawgs in 2008. It's tough for any one quarterback to be able to take every snap during the course of an SEC football season. Everyone hopefully expects starter Matthew Stafford to have a breakout Heisman type season this year, but just don't forget about Joe Cox. Cox came out of Independence High in Charlotte, N.C. as the the #7 ranked QB in the nation from the class of 2005. He and high school teammate Mohamed Massaquoi arrived in Athens together as two of the gems of that recruiting class. Don't you know the state of North Carolina hated to see these two prep stars go out of state? Joe Cox has not been a disappointment in Athens. He's just trapped behind Stafford. There are tons of college programs that would love to have Joe Cox as their starting quarterback. And yes he could start at 'tons' of schools. But Joe Cox likes the University of Georgia and Georgia likes Joe Cox. Not all players, especially at the quarterback position, are adept at coming off the bench cold into a game. Cox can perform under those circumstances as well as he could if he were starting. So if you see #14 on the field for the Dawgs this fall, don't panic. Joe can handle the situation.